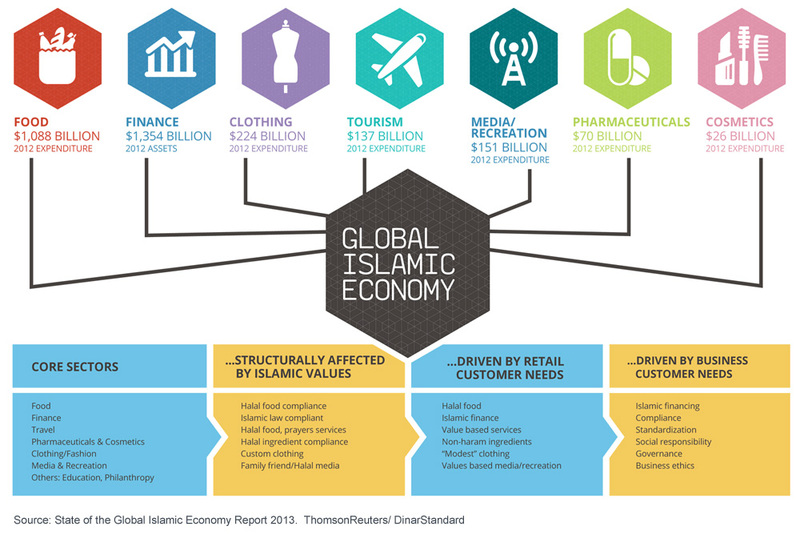 Nov 25, 2013: Given the growing trend of unique products and services that are catering to the large 1.6 billion Muslim population, there is a distinct lack of a comprehensive view of the existing Islamic economic landscape as well as its future potentials and opportunities. 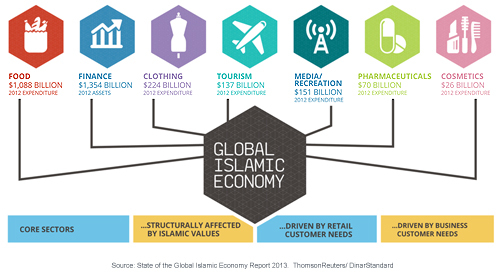 The State of the Global Islamic Economy 2013 Report fills this gap and was exclusively released as part of the Global Islamic Economy Summit 2013. The Report has been produced by Thomson Reuters in collaboration with DinarStandard (Author/ lead research.) In aggregate, Muslim consumer expenditure globally on food and lifestyle sectors (travel, clothing, pharma/ personal care, media/ recreation) is being estimated by this Report to be $1.62 trillion in 2012 and expected to reach $2.47 trillion by 2018. This forms the potential core market for Halal food & lifestyle sectors. Correction: Food & Beverage Infographic “Top Export Countries to OIC Countries: Meat & Live Animals” table is incorrect. The table represents “Top Export Countries to OIC Countries: Meat & Live Animals.” Correct “Top Export Countries to OIC Countries: Meat & Live Animals” are: Brazil, India, Australia, USA, and France. 1 The optimal scenario assumes full regulatory support for Islamic finance in OIC (Organization of Islamic Cooperation) markets and a 100% Islamic banking penetration with the proportionate Muslim demographic of OIC countries.